We appreciate for all entries and it’s our pleasure to exhibit total 152 creations from 9 countries from 1st Jun to 30th November. The total number of votes is 4,812 and it show that art is universe and beyond cultural boundaries. 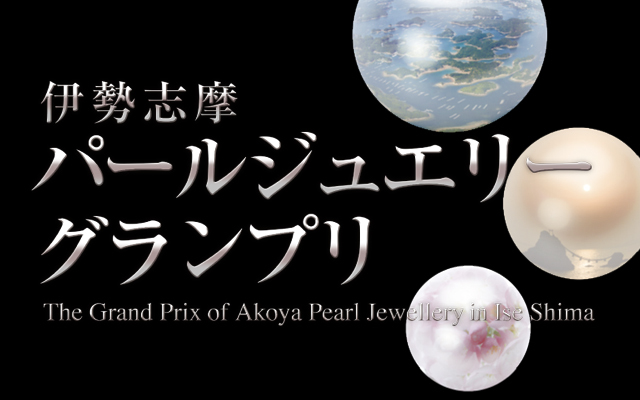 Thanks to all creations, entrants and supporters, voters, we’re happy to connect our hometown-Ise Shima-the birthplace of cultured pearls and the world. First of 1st award! Ms. Lihua Quan Coco(China) living in Singapore! 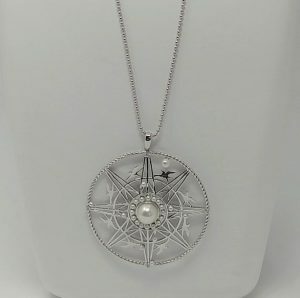 The handcrafted pendant is about a sailor’s love and hope.The pendant was built on a compass structure with four shinny diamonds. 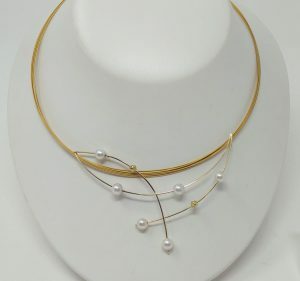 The elements chosen are symbols of sea-“Swallow”presents hope and love towards family as the bird never traveled far out to sea and historically sailors believe swallow can guide them to home and protect their soul.Different sizes of Pure fresh water pearls present starry sky and the moon and also show the beauty of the nature. I want the pendant to remind love and hope to the person who wears it. The waves which will not stop shine like gold in the morning sun. Ise Shima’s rich and calm nature gives us material and spiritual richness. 国籍 Country：日本（鹿児島県） Japan Kagosima Pref. This work is made of Turbo marmoratus by handcraft, also used akoya pearl with a ceramic nucleus, cultured in Ise Shima. This is Akoya oyster and Akoya pearl inside which is growing up with the waves of the sea in Ise Shima. I was inspired by the beautiful peninsula of Ise Shima. The multiple islands, coasts and rivers intertwined together forms a beautiful patchwork of nature.I want to showcase my appreciation and my interpretation of the bountiful harvest from the surrounding seas and beautiful pearls cultivated there,into a ring design. 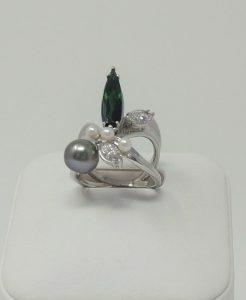 The two ring bands that intersects each other represents the seas and rivers flows in-between little islands.These islands are represented by marquis-shaped stones and the long tear- drop shaped deep green tourmaline gem .On the side, a South Sea pearl flows in to meet with three small Akoya pearls,representing the cultural and economical exchanges and differences that are happening now in the age of technological advancements.A contrast of the turbulent versus serene. 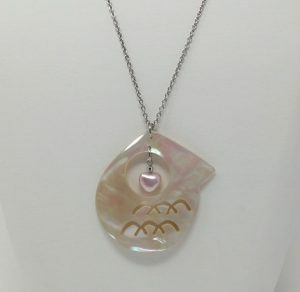 Akoya pearl, freshwater pearl and amethyst and rose quartz with wire work technique. 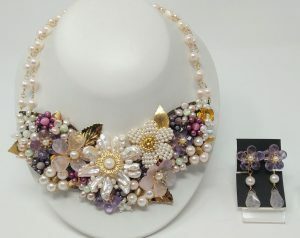 Expressing flowers that are blooming in the spring of Shima with different shapes, color pearls and different flower . Created while thinking about the scenery I wished to see with my friends and my father who loved flowers.